When you setup a dependency, you a create a dependent relationship between one form element and another. When you configure a dependency for an element, that element (field) may change depending on the result of a match condition within a rule. The element will either be required, made visible, or both. Since dependencies are rule-based, it is very important to understand rules before creating a dependency. Find the Dependency property in the Field General Setting group of the Element Properties Panel. Click the Edit Rule button to configure the rule using one or more filters. The rule is an integral part of the dependency, so you must add at least one valid filter in the rule in order to save the dependency. Again, see the Rules topic to understand how to properly configure a rule. In the Animate drop-down, select true if you want to animate the appearance of the field (this behavior only applies to the Field Visible actions). If you choose to animate, then you may optionally change the Speed and Animation Type. Click Save to complete and commit the setup of the dependency. To delete the dependency, click the Remove Dependency button. You can define a dependency on a group or panel to hide an entire group of fields with one rule. 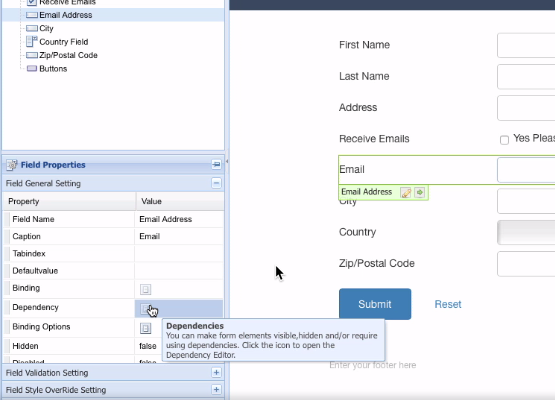 Though there is only one dependency for each form element, you can create more than one filter in the rule. Also, for dependencies, the Advanced Mode is available in the Rule Editor. There are many ways to use dependencies, including some of the examples we provide here. You can create a dependency If you need to make a field required based on a condition. For example, you might make a text field required if the user checks a checkbox, but leave it as optional if the checkbox is left empty. Another way to use the dependency feature is to setup the dependency property for several address elements. You could set the rule for each of those elements to be the same. The rule could check, for example, the selection that the user made in a Country special field. Depending on the country chosen, you could make some of those address fields visible (using one of the Make Field Visible choices in the On Match Action setting).